If you want a career in writing, you must keep the stories coming. In the midst of life, with all its ups and downs, words need find their way onto paper. Here’s how to keep the characters talking to you. Create an office. Even if you don’t have a separate room, create some sort of office space. You need a consistent place to keep your computer, your drafts and supplies. Even if it’s a box that sits under your bed until you need it, don’t waste your precious time collecting supplies. Instant Success. Do something small that will give you success. Perhaps just a character description or a description of a setting. A bit of dialogue. Start and end each day with something that you know you can complete. Use psychology. Tell yourself that you only need to write for five minutes. Quickly get into the flow and when you finally stop, you’ve likely done twenty minutes. The key is to keep writing no matter what. If you don’t’ know what to type, try this: I don’t know what to write next. Repeat that 100 times if you have to until it turns into something else. Believe me, you’ll get so bored with that phrase that you’ll write something else. Plan marathons. Kids are spending the night with someone and the hubby is going hunting? Bingo. It’s time for a writer’s marathon. Star as soon as the house clears out and write until late into the night. Get up early and repeat as long as you can. 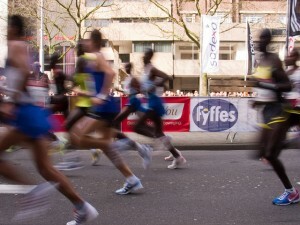 Marathons like this can jump start a big project, or get you through those rough spots. Plan a writing marathon to jump start a project or to finish your novel. Turn off the internal editor. Write, do not revise. Keep the flow of writing going and ignore the internal editor when s/he wants to stop and look up facts or check a dictionary for spelling. This isn’t the time for that. Instead, let the story flow. Stop early. Some writers swear by this technique: stop writing in the middle of a sentence and pick up right there on the next day. It makes sense. Just competing the thought gets your head back into the story and it’s easy to move on from there. Don’t wait. Are you waiting until you get answers to a bit of research or until you figure out a plot point? Instead, write and trust the process. Trust that there will be tidbits to save out of whatever you write. Trust your instinct. Don’t worry so much! And certainly don’t think about what a reader or an editor will say at this point. Just write. Trust your storytelling ability and write. Trust your sense of story. Trust your choice of words. Write, write, write. These are great tips. I would love to have a writing marathon, but since my hubby retired he doesn’t go anywhere very much. If he goes to Home Depot for an hour, I feel like I’ve had a vacation. I do marathon when writing the first draft. After that, I set up editing goals or I’d slack off as often as possible. Very good tips. Creating a space is particularly important. However, I might add that it is good to practice writing outside of your space from time to time. I was unexpectedly out of town for a long period time for a family emergency and found I could not write because I’d too dependent on my writing space to get me in a creative state of mind. Now, I work at least 1 day out of my space to avoid that pitfall in the future. Interesting. I hadn’t thought of that. Yes, we need to keep producing even in the midst of Life (with a capital L). I find it’s easier these days, as long as I have my computer. But you’d probably warn me to also write without my computer. Right?